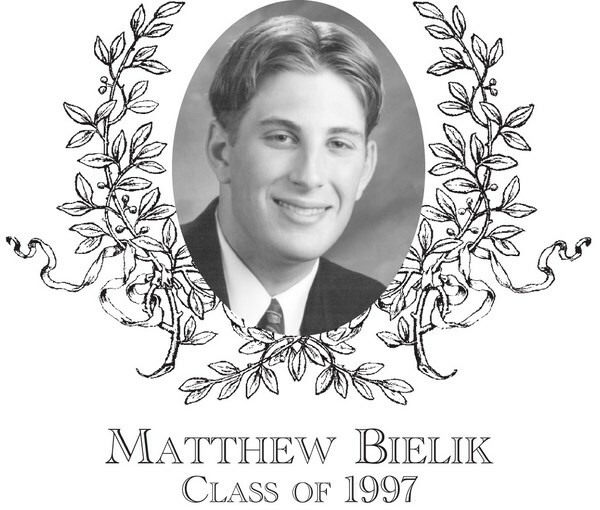 Matthew Bielik, Class of 1997, was an outstanding three sport athlete at Bartlett High School. During his high school career, Matt earned nine varsity letters in Soccer, Basketball and Baseball. As a goalie in soccer, his size (6�5�) and wing span made it difficult for opponents to score. Coach Dave Hackenson had to rely on Matt�s defensive skills in goal to keep the Indians in most games. The lack of a consistent offense made Matt�s numerous shutouts noteworthy. In basketball, Matt spent time on the Junior Varsity and Varsity teams his freshman year. As a sophomore, he became the starting center and would dominate play in the Border Conference.Coach Don Cushing selected Matt as Team MVP his sophomore, junior and senior years. Matt led the team in scoring and rebounding and was a unanimous selection to the conference All-Star Team all three years. Matt joined the elite 1,000 point club at BHS with an explosive performance against rival Southbridge High School. The lack of post season games did not prevent Matt from reaching the 1,000 point plateau in the second shortest number of games in Bartlett High School history. During the spring, Matt split time as a pitcher and first baseman for the Indians. His steady hitting and fielding helped his team to a Division II final. He was recognized as a Border Conference All-Star in both his Junior and Senior years. Matt was truly a student/athlete. He held membership in the National Honor Society and at graduation he was awarded The George Finnegan Award as the top male athlete at BHS. After high school, Matt enrolled at WPI and pursued a degree in Actuarial mathematics. He was a member of the basketball team in his freshmen and sophomore years earning accolades from the ECAC and Constitution Athletic Conference. He also captained the golf team and was a medalist at the NEAUMAC Championship. Matt continued his education after graduating from WPI, earning a Master�s in Business Administration (MBA) from Clark University. He is currently employed as a Business Analyst Consultant at Fidelity Management and Research Company. Matt joins his brother, Jason, as a member of the BHSAthletic Hall of Fame. Matt and his wife,Alicia, now reside inWenham,MAwith their two girls Samantha andAva.